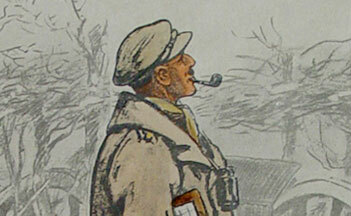 Lithograph – "foxing" effects on two types of paper. 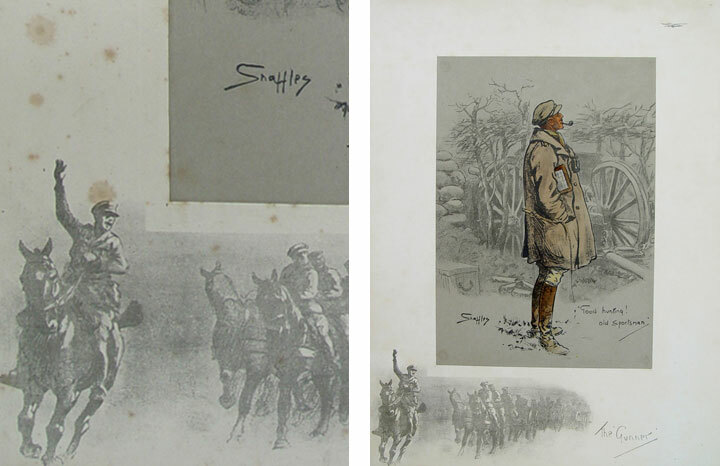 This lithograph taken from drawings by "Snaffles" (renowned for his sporting prints) is a composite of two separate prints on different papers. The inner rectangle is a lightweight rag paper glued onto an outer sheet of rag and pulp mix of a much heavier weight. The effects of condensation have produced stains largely to the outer pulp paper with minimal staining to the rag paper. The procedure required separating the two papers in order to remove glue residue before each could be treated.